In his Letter to Bishops, Priests, Consecrated Persons and Lay Faithful of the Catholic Church in China, dated May 27, 2007, Pope Benedict XVI writes: "Dear Pastors and all the faithful, the date 24 May could in the future become an occasion for the Catholics of the whole world to be united in prayer with the Church which is in China. This day is dedicated to the liturgical memorial of Our Lady, Help of Christians, who is venerated with great devotion at the Marian Shrine of Sheshan in Shanghai. I would like that date to be kept by you as a day of prayer for the Church in China. I encourage you to celebrate it by renewing your communion of faith in Jesus our Lord and of faithfulness to the Pope, and by praying that the unity among you may become ever deeper and more visible . . . On that same day, the Catholics of the whole world – in particular those who are of Chinese origin – will demonstrate their fraternal solidarity and solicitude for you, asking the Lord of history for the gift of perseverance in witness, in the certainty that your sufferings past and present for the Holy Name of Jesus and your intrepid loyalty to his Vicar on earth will be rewarded, even if at times everything can seem a failure" (no. 19). Vatican City (AsiaNews) - Today the text was published of the pope's prayer for the Day of Prayer for the Church in China, which Benedict XVI himself instituted. 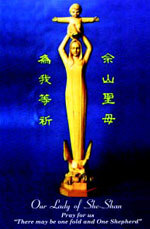 In his Letter to Bishops, Priests, Consecrated Persons and Lay Faithful of the Catholic Church in China, dated May 27, 2007, the pope writes: "Dear Pastors and all the faithful, the date 24 May could in the future become an occasion for the Catholics of the whole world to be united in prayer with the Church which is in China. This day is dedicated to the liturgical memorial of Our Lady, Help of Christians, who is venerated with great devotion at the Marian Shrine of Sheshan in Shanghai. I would like that date to be kept by you as a day of prayer for the Church in China. I encourage you to celebrate it by renewing your communion of faith in Jesus our Lord and of faithfulness to the Pope, and by praying that the unity among you may become ever deeper and more visible . . . On that same day, the Catholics of the whole world – in particular those who are of Chinese origin – will demonstrate their fraternal solidarity and solicitude for you, asking the Lord of history for the gift of perseverance in witness, in the certainty that your sufferings past and present for the Holy Name of Jesus and your intrepid loyalty to his Vicar on earth will be rewarded, even if at times everything can seem a failure" (no. 19).